The heyday of the music we call West Gallery was from the early eighteenth century to the mid nineteenth century. It was performed by ‘church bands’ which were sometimes referred to simply as ‘the singers’ even though they often included instrumentalists. 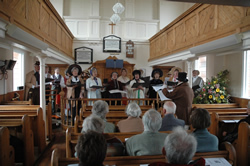 Following Cromwell’s destruction of the fabric of the church in England music formed little part of the church service until around the turn of the eighteenth century. At this time galleries were erected over the west door of many of the old parish churches to accommodate ‘the musick’ as it was also known. The term ‘West Gallery Music’ was coined by Thomas Hardy late in the nineteenth century to refer to the music of this period. The music itself has qualities which we would not necessarily associate with religious music. It is written for four voice parts, Soprano, Alto, Tenor and Bass. Early in the period the melody is most frequently found in the tenor line moving to the Soprano line in later years. It was sung, according to a contemporary instruction, ‘forthrightly and with good courage’ with the musicians and singers adding passing notes and grace notes at will. All singing in West Gallery music uses the powerful chest voice, with the tenor line often sung by women as well as men, and both voices and instruments doubling each other an octave apart. There are frequently small instrumental sections known as symphonies which give the players a chance to shine. West Gallery singers were members of the local community; farmers, shopkeepers and tradesmen, with the occasional schoolmaster to provide the necessary degree of musical literacy. They usually provided the music for weddings, funerals, village ‘hops’ (an eighteenth century term) and other social events in their community. Contemporary accounts show that some of these bands saw themselves as exercising considerable power at a parish level and they often came into conflict with the local church hierarchy. Records show that they sometimes sang where and when they chose, and used tunes they preferred rather than those they had been asked to sing. They might also split the sacred words mangling the text and robbing it of its devotional sense. These and similar practises led to their decline and fall with the clergy wresting back control. 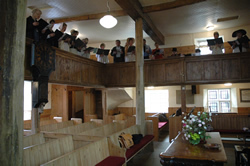 There was a general movement towards surpliced choirs with more solemn music, accompanied by an organ, and in which the whole congregation could join. This was the end of ‘the singers,’ and the instruments were disposed of. Most of the wooden galleries were torn down, though a few remain and we sing from them when we can. The music then dispersed to the Baptist and Methodist chapels and to village inns and alehouses. By the late 1870’s it had all but disappeared from churches. For further information go to the West Gallery Music Association. Included in our repertoire are also some American shape-note pieces. Also in four voice parts, this music originated from English psalmody but was taken to New England in the seventeenth century and developed in its own way. It was sung equally vigorously but unaccompanied, probably due to the lack of availability of instruments. Singing schools were held at which the music was learned using a system of shaped note-heads hence the name. As with West Gallery music it fell from popularity and died out in all but a few southern states. Within the last thirty years or so it has been re-introduced all over the United States and during the last twenty years has returned to the UK. For more information visit the UK Shapenote site.